March 2013 Please click on the links to read the full story! Paul Penders has stood for an end to animal testing from that day some 40 years ago when he first personally witnessed the horrible cruelty inflicted on animals in the name of science. It’s great news that after years of debate, at long last the EU Ban on animal-tested cosmetics goes into effect this month! It’s an old family recipe dating back to Paul Penders’ grandmother, updated for the 21st century – and the secret behind Paul Penders exceptional natural beauty products. It must be in the genes. It seems all the Penders carry on the family tradition, exploring the possibilities of fresh organic ingredients directly from Mother Nature for health and beauty. PP in the news! We introduce a few of the beauty bloggers from around the world who have discovered – and liked! – PP products. A D-I-Y – do it yourself – our blogger has tips picked up from a Chinese salon for pampering yourself. Are You a Super Shopper? What are your criteria for choosing personal care products? We don’t have to be taken in by the ‘Big Boy’ brands if we know what to look for. Sometimes, small is better! Just up the street from the PP HQ in Teluk Bahang, Penang, a brave dog lover shelters some 250 stray dogs. She gives them much more than just food and a roof. PP is committed to supporting the work of her 4PAWS organization. It’s Time to Clean House, Part 1: A New Year, A New You! Well, it always takes a bit more work than that but now that the New Year has started, it’s a good time to clean house. It’s time to update your look and renew the ‘magic wands’ you use to get that look. Somehow you always feel lighter after doing some serious cleaning and re-organizing. Move that bookcase and get the dust bunnies out from under it. Wipe down the tops of shelves and closets. Reach way into the backs of cabinets and chase out spiders. Give away or sell any clothes you haven’t worn in the last year. Go through your collection of makeup, skin and hair care products (you know you have one. Clean and clear away the old and make room for new products that help create the new, updated you. One good ‘clutter clearing’ tip is to throw out anything your hands haven’t touched in a year. Make three piles: use, trash, or donate. Then be sure to take action! Think about designing a new look for the coming year. Purchase new items that will make you feel really beautiful — and get rid of anything outdated or expired. Take some time to go through your cosmetics and personal care products. Do the colors of your eye shadows really suit you? Do you have tubes of lipstick or foundations that you never use because you don’t like the taste, texture, or the color is just too bland or too bold? It’s time for them to go. Did you find unopened boxes or items still in near-perfect condition? Open and use them or give them away to someone – they’ll (usually) appreciate the gift. Give yourself the gift of a “New You” – What do you want to look like and feel like this coming year? I am wading through a sea of dogs! And wondering about the choices we make to create beauty, happiness, love and even purpose to our lives. It’s a hot sunny afternoon on the island of Penang in Malaysia. A golden light slants in through a green jungle of palms and bamboo. I am following this small woman in a butterfly T-shirt through a rusty gate and into a cool and shady paradise – for dogs! Dogs bark greetings and crowd around us in welcome. There are hundreds of dogs here! We’re about an hour outside of the historical city of Georgetown, on the western tip of the island facing the Andaman Sea, where the fishing village of Teluk Bahang sits surrounded by green hills. Barbara picks me up at the Paul Penders HQ Penang Office and drives me up to her home tucked into a hillside above the town. Her ‘receptionist’ – a lone dog — comes out to greet the car. From behind her comes a happy sound: a symphony of barks. This place is truly doggy heaven — surprisingly clean and well-maintained, with no noticeable doggy-smells or ‘surprises’ underfoot. People can also live here quite comfortably – Barbara and her 4 helpers sleep here as well. We push slowly through the pack as Barbara explains that dogs needing homes arrive almost every day. Social creatures, the dogs seem happy — they have lots of company and room to play or just hang out on a couch or a table. And towards the back, the buildings open into sunlit gardens above a gently flowing river. 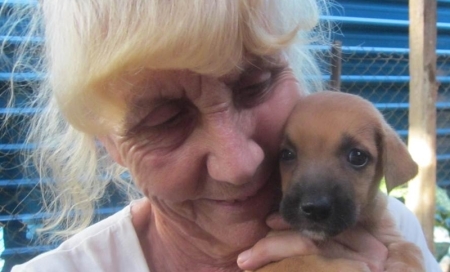 I can’t help but admire this woman who devotes her life and her pension money to sustaining this home for homeless dogs. “My pocket is my sponsor,” Barbara says. In the past few years, she has begun to receive some outside support from city councilmen, other animal care organizations, and a few companies like Paul Penders– all dog-lovers. 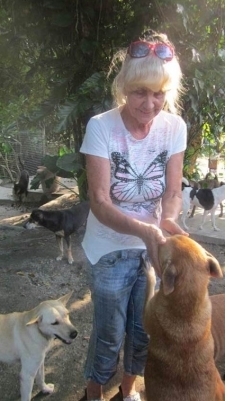 She was able to incorporate and receive non-profit status and now you can find “4 PAWS” – Penang Animal Welfare Society – on Facebook and it has its own website at http://4paws.com.my. Most of the responsibility for the continuance of the shelter rests on Barbara’s shoulders. Her smile shows clearly that she receives great rewards for her life choice – she knows the names of all the dogs, knows which ones need special attention or veterinary care. Why does she do it? I think the answer is simply Love. She gives it and gets it back many times over. The dogs obviously adore her! The choices we make can give meaning to our lives. Barbara is just one of the many throughout the world who choose to devote time, money, and care to providing for animals. Other people have found a community or a cause that they care about and work for a higher, greater good. It may not be a logical or practical choice to devote your life to caring for others in need but it does give your time here on the planet an important purpose. Giving love is a beautiful choice. I could answer that question so many ways. How would you answer it? That’s a good first step in establishing your ongoing skin regime – one that can last you a lifetime. Look at your overall skin condition. Are there any patches of discoloration, blackheads, whiteheads, enlarged pores, oily or greasy areas and any regions that may be extra-dry? How about the sensitive areas around your eyes and lips? What would you say about their current condition? How would you like them to be? Smoothness – moisturizers and a good foundation give not only the appearance but also an actual smooth, soft feel to your skin. And don’t just stop there! Skin care is just one part of overall body care – don’t forget to budget in time and money to care for your hair and your nails. Think about any changes you should make to your diet, exercise activities, even your social life! How often will you dress up or dress down? How will you maintain the best hygiene for yourself and the applicators you use? You’ll want to consider costs as well as how long products can be used. If you think you will need to go to a professional spa regularly, you can weigh that cost against purchasing more expensive products that you can use at home. And finally, what specific steps will you take daily, weekly, and monthly to ensure that you look (and feel) your best? Remove make up every night: It’s so important but so easy to forget! Face wipes make it so quick and simple so there’s no excuse! Start using a moisturizer with SPF: We’ve heard it a million times; the sun damages our skin even when it’s cloudy. Be determined to protect against sun damage and premature aging this year with a high factor SPF moisturizer. Find the right foundation: Go to an in-store consultant who can scan your skin to help you find your perfect match. Invest in an eye cream: Sure, you can use moisturizer as an eye cream but the skin around your eyes is so delicate, it really does need a cream of its own. For reducing dark under eye circles. (0.8 oz – 20 g). Helps prevent and reduce puffiness, dark circles, lines, wrinkles and other signs of fatigue, poor circulation and stress. 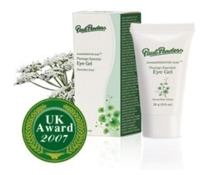 Plantago helps reduce bruising while aloe vera and chamomile calm the delicate under eye skin. These herbs are cold-blended with other selected organic herbs to improve microcirculation and elevate moisture levels in the sensitive eye area. 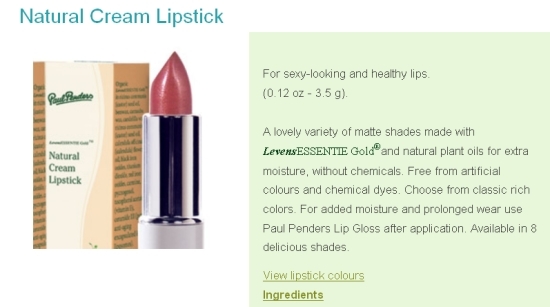 Includes LevensESSENTIE Gold® – a mixture of 22 certified organically grown herbs – a traditional formulation which is the pride of Paul Penders. Suitable for all skin types. Which personal care product should I pick today? Are you a ‘Super Shopper?’ If you’re like me, you wander up and down the aisles at the grocery store and pharmacies reading labels. You may gaze longingly at the window displays at professional beauty salons. The choices available seem endless! What makes one better than the other? Which one is best for your personal health and really enhances your beauty? Of course, you can always pick one of the ‘big boys’ – they’re everywhere! I can even get mini-bottles of shampoo at my local convenience store. That worked for me until I went to China. I found a shelf of 14 different colored shampoos but all the labels were in Chinese – which I can’t read! Too many choices! Over the years, I’ve developed some basic criteria for choosing personal care products. Please write to us here at the PP Blog at ppblog@paulpenders.com if you have more suggestions to add to this list! Targeted Effects – Don’t choose a dandruff shampoo if you don’t have dandruff. You’ll probably get it! The first thing to look at on the box or bottle is whether it meets your specific needs. Ingredients – By laws in almost every country, manufacturers must list all of their ingredients. One exception is fragrance – there can be a lot of different molecules in tiny quantities to make the scent and governments don’t require them all to be listed. Ingredients are listed in order of the amount used in the formula. When I see the contents lists “water” as the first ingredient, I usually put that one down and look for something more concentrated. I can always add water! Health Benefits –A few kitchen disasters and several sunburns have taught me that aloe vera really does help heal damaged skin while arnica gel has relieved many a torn muscle. My mother’s home remedies of lemon and vinegar for hair rinses really did lighten and brighten my hair as a child. And her compresses of witch hazel cooled my childhood fevers. Personal experience with ingredients may be the best teacher, especially because some people will have allergic reactions to an ingredient that others find helpful and healing. Research – What does science say? Maybe in the past, makers of beauty products could slip in toxic chemicals but no more! The internet-literate customer is forcing a huge change on all kinds of industries. We do our homework! In fact, marketing people now realize that the typical customer these days has become much more sophisticated. We map out and list our needs, then read studies and reviews before we buy. If science says phthalates and parabens cause harm, and there’s empirical evidence from ‘people testing’ to prove it, then I will try to avoid them. The more you know, the safer you are! Branding – Here’s where your research can really make the difference. Sure, we all know the ‘Big Boy’ brands – they spend billions on advertising to make sure we recognize their names. But think about it – how healthy is a can of Coke or a Big Mac, no matter how delicious? So-called “impulse buyers” (we all fall into this category sometimes) walk into a store and are attracted to the bright colors, fancy graphics, and familiar names of products. If there’s an emotional connection, whether because of a touching TV ad or a personal experience we’ve had, we’ll gravitate to those items. But nowadays, we no longer need fall into the traps of these predators. We can find out a lot about the companies we buy from simply by ‘googling’ them. We can read their annual reports, marketing materials including their websites, blogs, and Facebook pages. We can find product reviews by both professionals and consumers, and scholarly treatises on their influences. Perhaps most importantly, we can find out what causes they support and what political biases they may promote. If you agree with their stands on issues like animal testing, safe ingredients, government regulations, etc., then buy from them. If you don’t, you have the power to protest by simply not giving them more money and refusing to buy their products. Being a ‘Super Shopper,’ you know personal care products are power tools. They meet more than basic needs; they are an investment in your health and beauty. They can influence your personal power to get that good job, attend that special party, maybe even attract that perfect love. Why waste your personal power on ‘fast food’ beauty products with name brands? For about the same cost – or often less – you can choose to support a small company, perhaps even a local one, that makes a product that is safe, healthy, uses the finest ingredients, and is targeted to your specific needs? Of course, it’s always possible to go back to simple soap-and-water but if I have the money to invest in personal care, I also have the power to choose and to support the best. How do YOU choose your personal care?